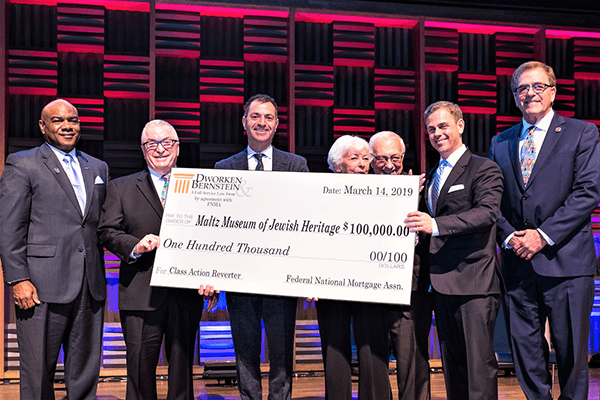 (CLEVELAND, OH) March 27, 2019 – The Maltz Museum of Jewish Heritage has received a $100,000 distribution from the law firm of Dworken & Bernstein to support its mission to combat hate in all forms through anti-bias education. The firm uses a doctrine known as “Cy Pres” to redirect unclaimed funds generated in class actions to meet the needs of the community, and have distributed funds in excess of $37 million to support literally hundreds of charitable causes. Past supported causes cut across the entire spectrum of community needs, from addressing poverty, hunger, homelessness, and opioid abuse to fighting diseases resulting in physical and mental illness to supporting institutions of education and hospitals, and the list goes on. The firm is proud to add the Maltz Museum to its list of beneficiaries. Each year, many as 30,000 visitors experience Jewish history, culture, and tradition come to life through the Maltz Museum’s exhibitions and programming. Approximately one-third of those visitors are students who visit on school tours to learn about the importance of being upstanders. Through the Museum’s Stop the Hate® initiative, students are asked to consider the benefits of a more inclusive society, the consequences of intolerance, and the role of personal responsibility in effecting change. The Maltz Museum’s most popular student tours are “Introduction to Themes of the Holocaust” and “Stop the Hate.” Both tours focus on historical figures and events and use artifacts, photography, and interactive media to lift history out of the books and into life. Often, students will also hear from a Holocaust survivor who shares their personal story of what they went through during what is arguably one of the world’s most violent periods in history.